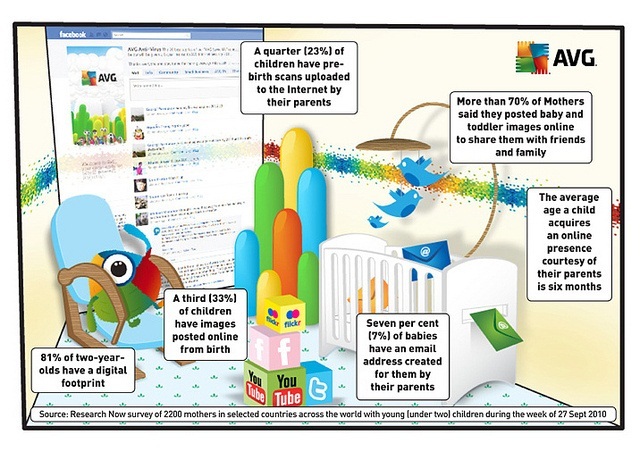 Last week, AVG posted, on its blog, results of a study the company did on the digital footprint of babies. The company polled mothers with Internet access who have children under the age of two in the UK, France, Germany, Italy, Spain, the USA, Canada, Australia, New Zealand, and Japan to find out how much of a presence the children had on the internet. The results were interesting, though not surprising: There wasn’t any information about how many parents were surveyed or about the methodologies, so I’m not sure how scientific it all was, but the number certainly seem right. Nearly all my Facebook friends posted ultrasound pictures of their kids, and among my peers the paper birth announcement is out in favor of the virtual (one of them even created a Facebook profile for his newborn daughter). Many people found out that Nora had been born and that she was a girl about 45 minutes after her birth when my friend Margarete uploaded a picture from her blackberry. And, less than 24 hours later, from free hospital wifi, we announced her name and stats on Facebook and our old Hinds Family Blog. Like it or not, Nora has a virtual footprint. By the time she’s old enough to actually surf around on the internet, there will be 14 (or more!) years of her life documented here on my blog, assuming that I keep it going. It presents a few interesting questions that are unique to children of her generation. encourages writers to write honestly, no sugar-coating. That can mean an unflattering detail about another person, and that may be a necessary writer’s choice in order to tell the story. But I’m not sure that I’m (or my family is) ready for that level of honesty. Besides weighing the impact of my writing on my husband, parents, and other family members, I also have to think about how the writing and photographs will impact Nora. 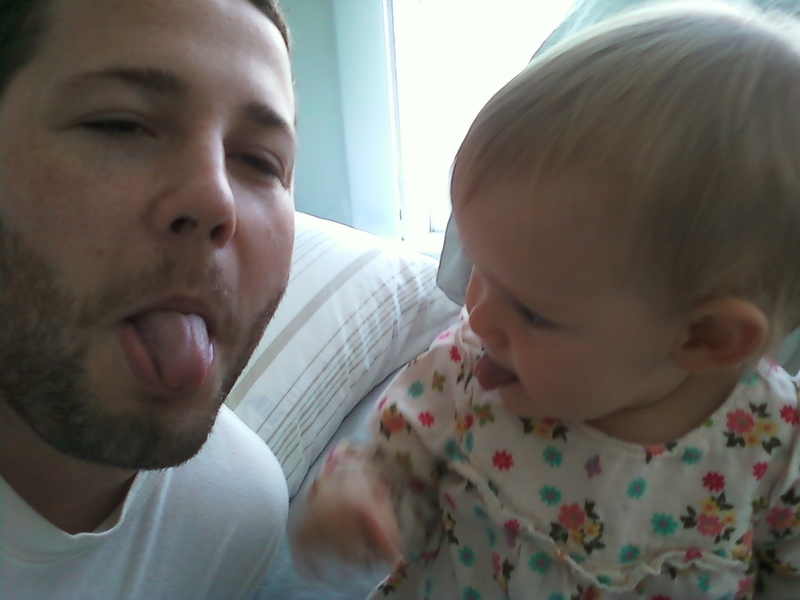 Will she be embarrassed by photographs of her sticking out her tongue? Or will she be annoyed by the fact that most of her life is chronicled in a public forum, rather than a small scrapbook at home? 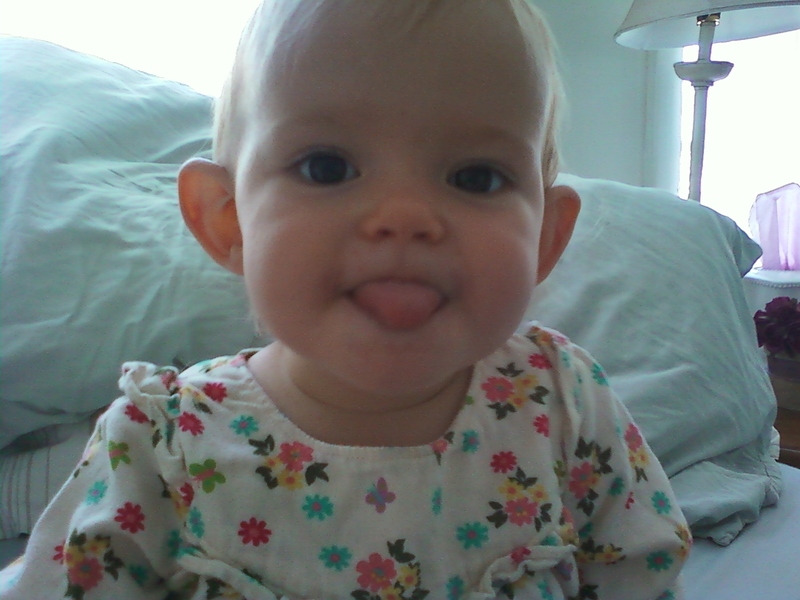 Should I have started out blogging about her with only a codename, as many “mommy bloggers” do? What details about her life are fair game and what should be left off the computer screen? very hard to draw a line between writing about them as actors in my experience of parenting and writing about them as the leads in their own lives. That line is a really great one, I think, especially as Nora grows older and becomes more cognizant about making choices and engaging in her life. 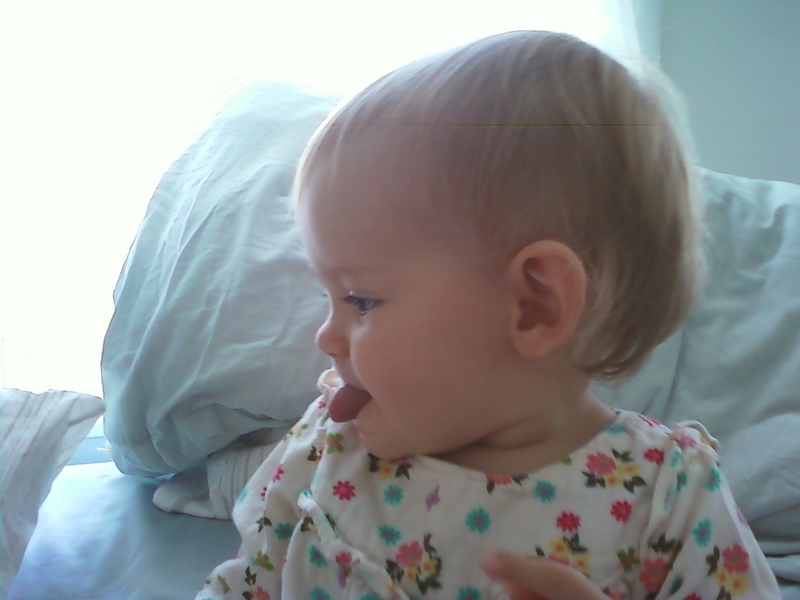 As an infant, I think it’s less worrisome to write about her as the lead in her life – especially because our two experiences are now so entwined; with age and independence her life will be less controlling of mine and less subject matter for Au Coeur. I’m also hoping that someday she’ll be interested in reading through my blog to see what her early life was like and who I am, besides just a two-dimensional mama. 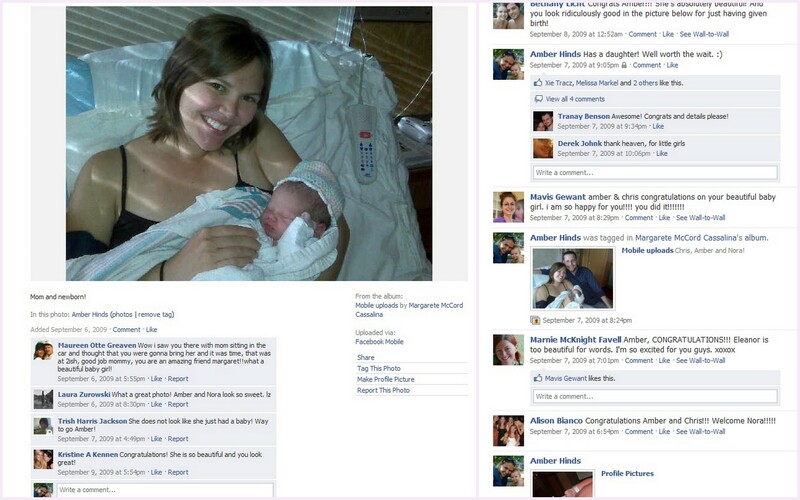 If you’re a parent who writes about your kid(s) on Facebook or on a blog, I’d love to know what you think about this. How much and what is okay to say? How and where do you draw the line? What do you think your kids will think about the virtual footprint you’ve created for them? I guess my biggest hope is that my sons (especially the baby..I also have a teenager) will get a chance to know, more clearly, what his little life was like before he could remember. Or at least from his crazy Mom’s perspective. Things we did, or even the day to day life. The stuff we forget. I love sharing the trials and adventures of being a working mom. it’s a lot to juggle. I just think my tiny blog is just a smidgen of internet real estate and it probably won’t matter much in 20 years. Technology will have bigger and better things and I will hopefully have printed my blog into a book form. also, I do have a kinda alias ..didn’t start out that way but I do now. I also don’t rant on my blog…if I do I keep it positive because I am not here to whine my day away. great topic, thanks for bringing it up and Nora is BEAUTIFUL. Thank you for pinging my blog! This remains an interesting topic and deep concern for me, more and more as my kids get older — they’re 10, 14, and 18 — and have an Internet presence that they control. (All three have Facebook profiles, and two have dabbled in blogging.) So many parts of their lives make for interesting stories that I want to tell. However, I also know it would inappropriately rupture their privacy and possibly create audience problems for them! Sometimes the ethics of telling are pretty black and white to me, and I proceed, or not, based on my own conclusion. Sometimes, though, it seems more gray, and I end up asking them for permission: “Can I write about what happened, or what you said?” It turns out the be an interesting conversation and, even if I don’t get to write about them, I do like to think that they are developing their own ethics of public communication from these discussions. And speaking of communication… I don’t know if I’m quite comfortable with Pat Schneider’s notion that we can write unflatteringly about someone else, if that aids the story. To me, that violates the “comm” — or community — in communication. If I, for example, write something about one of my siblings that compromises his or her reputation in some way, I would be dishonoring the private communication I have with that sibling in order to advance a public communication that would most likely benefit me only. Sometimes I ask another adult — a sibling, a friend, my husband — is it okay to write about you? I could imagine another, more seasoned or conventionally successful writer reading this and thinking that I had somehow sacrificed the ideals of art and truth for the day-to-dayness of human ties. Perhaps I have. On the other hand, I actually enjoy working within the boundaries or constraints that the privacy problem presents and figuring out how to write and publish a good story, an honest one, that doesn’t at the same time create a private injury. I guess to what degree you share depends on your purpose for writing. Do you write to document, promote, share or some other reason? I have an online journal at livejournal and use Facebook. I talk about my family both places, but I try not to post unflattering things. Probably because I write about my family for amusement, and I think part of being in a family or being a good friend is to build each other up. I’m honest but selective. Unfortunately we are an unphotogenic bunch. So all the photos we share are embarassing, but I share anyway. If my children bother to read what I’ve written, and I think it’s a stretch to think they will, I hope that they will enjoy the stories I’ve written about them. Purpose is sort of an interesting thing for me right now. I first started blogging after I found out I was pregnant merely as a means of keeping my and my husband’s family informed on our life. But as time went on and I started this blog (originally I was blogging at a different address), the purpose is shifted. I do still want our families to be informed, but I also use the site as a means of highlighting my personal journey and to contribute to some broader discussions on parenting and other topics. As the former, it’s not problem to leave out details which may bother others…as the latter, it can be a lot more challenging to leave out details which are potentially bothersome, but are completely relevant to my journey.